Here we are again, ending another year. A perfect time to put closure to the past. A perfect time to dream and a perfect time to create an inspiring future. Please join me in January, 2012 for the annual Endings and Beginnings workshop. 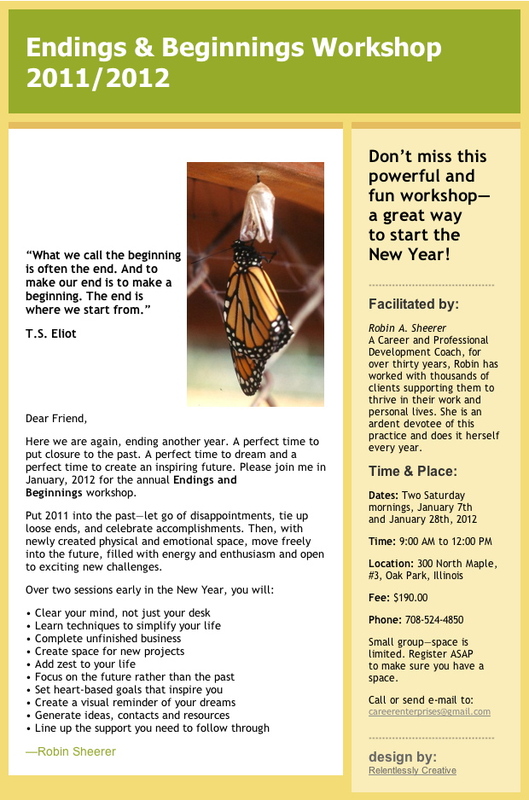 Put 2011 into the past—let go of disappointments, tie up loose ends, and celebrate accomplishments. Then, with newly created physical and emotional space, move freely into the future, filled with energy and enthusiasm and open to exciting new challenges. Robin A. Sheerer. A Career and Professional Development Coach, for over thirty years, Robin has worked with thousands of clients supporting them to thrive in their work and personal lives. She is an ardent devotee of this practice and does it herself every year. Small group—space is limited. Register ASAP to make sure you have a space.